Aotearoa’s current support for asylum seekers and convention refugees is far from satisfactory. However, change is on the horizon. This event is a unique opportunity to hear a diverse range of perspectives on current refugee policy. We will learn about the impacts of our policies on asylum seekers first hand, examine the development of New Zealand’s attitude towards asylum seekers through history, explore a te āo māori approach to refugee policy and re-imagine our approach to the asylum claims process with these perspectives at its heart. Look forward to musical entertainment, delicious refreshments from Pomegranate Kitchen and a video presentation created by the Asylum Seekers Equality Project. Since World Vision launched their #KidsOffNauru campaign in mid-August, the deplorable conditions in which the 119 children on Nauru Island are living in have come to light. The refugees and asylum seekers are faced with substandard conditions where they lack access to adequate healthcare, education and protection from physical and sexual abuse. Many have witnessed or been subject to abuse or harm, hundreds of such incidents were reported by the Guardian Australia in 2016. Australia’s offshore policy is designed to deter people from embarking on dangerous sea voyages in the hopes of claiming asylum. In 2013 the Australian government introduced a policy that any asylum seeker arriving to Australia by boat would be sent to Nauru or Manus Island for processing. If granted refugee status, they would be able to settle in any other country than Australia. These policies have received sustained heavy criticism for their violations of human rights. The Australian government said in a statement that “children of refugees and asylum seekers on Nauru have access to education, health services, welfare, good accommodation and a range of social services provided by the Nauru and Australian governments. Nauruan children grow up happy and healthy on our island. Activists [are] playing politics and distorting facts.” However, the reality on the ground in Nauru starkly contrasts the picture painted by the Australian government. Since the children arrived to Nauru, they have remained neglected and have faced substandard living conditions, education and health-care services. The children of Nauru have been forced to live an alien and hostile environment. Some children have been born on the island and have never known anything other than fences and guards. Some have had to endure the conditions on Nauru for almost five years. The situation in Nauru has reached crisis level, and the children’s plight is only worsening. Refusing food for more than two weeks, a 12-year-old child held on Nauru has been on a hunger-strike. Just recently, amid mounting concerns around his health, he has been flown to Australia for treatment. A girl suffering “resignation syndrome”, where one withdraws from life around them by refusing food and water, has been ordered off the island by an Australian court. She is the latest to join a string of critically ill children who have been removed from Nauru for urgent medical care. A 14-year-old boy suffering from major depressive disorder and severe muscle wastage was flown directly to Brisbane. Doctors are concerned he may never be able to walk normally again. Two-year-old Roze was born on Nauru: her family has been waiting for their new home for five long years. Reports have also indicated that last week, a 12-year-old girl was taken to Nauru hospital after reportedly attempting to set herself on fire. The girl has made repeated attempts to end her life in recent weeks, with the most recent attempt being witnessed by several other children. A psychiatrist on the island has recommended she be moved to Australia immediately. Since Thursday 23rd August, three children have left the island, with reports coming in of several more children, some as young as 12, in similar critical conditions. Self-harm and suicide attempts, including by self-immolation, are growing routinely common on the island, among both adults and children. The medical staff on the island is overwhelmed by the current crisis. Their referrals for children needing urgent transfer from the island for medical care, have continuously been rebuffed by Australian Border Force officials present on the island. Since December 2017, at least 14 legal challenges have been brought before the federal court seeking immediate orders that children be moved from Nauru to Australia, where they can access the higher-level care they so desperately need. Tired of being pushed aside and forgotten, refugees on Nauru hold a protest. As part of a deal with Australia, the previous US administration offered to welcome refugees from both Nauru and Manus Island. However the process has been slow. Difficulties have also arisen as the new US administration introduced new restrictions about which nationalities it will accept as refugees. The reality is that many of the children and their families on Nauru have no hope for resettlement in the US due to these new restrictions. World Vision’s campaign aims to have the Nauru children and their families to be brought to safety and resettled in New Zealand before Universal Children’s Day on 20th of November. Join us, make your voice heard, and help get the #KidsOffNauru. Recently our Government team sat down with Suzanne Malan, a principal advisor at the Ministry of Business, Innovation and Employment (MBIE), to ask how they are actively fulfilling the promises they made in their Refugee Resettlement Plan. While this is a fantastic step towards improving the refugee resettlement experience, several aspects of its implementation remain vague and require continued monitoring to ensure that improvements occur. With this in mind, ASEP’s inquiry concluded with some unresolved questions. Notably, some answers were ambiguous and were rounded off with an admission of needing to “double check”. Funding will not be increased to Pathways to Employment and NGO’s. MBIE unfortunately also dodged some of ASEP’s harder hitting questions regarding mental health services for refugees. Although there are complexities around addressing the specialised services required for refugee trauma, the lack of services was justified by stating that it is generally difficult to access mental health services in New Zealand. This was an unacceptable answer to the ASEP team, who pushed the point that these services were unrelated to the general community’s concerns with mental health services, which was acknowledged. Regardless, no promises were made. Housing was another issue that was brought up during the meeting and it was concluded that the people most likely to get help were those who are worst off or homeless. Again, no strategies or timeframes were mentioned. Overall, MBIE’s approach to the Resettlement Strategy is a step in the right direction. However, has also shed light on some troubling gaps concerning information on services pre-acceptance, mental health, and housing, which ASEP will continue to fight for. Why the 2018 FIFA Football World Cup belonged to Immigrant and Refugee players. In the midst of emergent global nationalism and xenophobia, ironically the makeup of some of Europe’s beloved football teams is increasingly multi ethnic. – at least from the mouths of football fans. If such players weren’t allowed to compete, the world cup final would have looked, well, different. The Croatian team, often hailed as the “New Zealand of football”, with its small population and proportional talent, owes its success to more than one former-refugee player. Its captain, Luka Modric, grew up during the Croatian War of Independence and spent his childhood living as a refugee. Dejan Lovren is another Croatian whose family fled to escape war as a child, spending years living as refugees in Germany. He described his family’s desperate escape from a bomb shelter in the documentary My Life as a Refugee and urged rejecters of refugees to reconsider. Victor Moses lost both parents as a child due to religious conflict in Nigeria and was sent to England by extended family as an Asylum Seeker. Xherdan Shaqiri was born in Yugoslavia. His family immigrated to Switzerland after his Uncle’s house was burned down and family home ransacked in the Kosovo war. When ethnic violence in Valon Berhami’s village in Yugoslavia increased, his family decided to move to Switzerland while his uncle and cousin lost their lives in the war back home. ASEP chatted with Vic student Bryony Harrison about why she has decided to embark on the Ration Challenge by eating the same food rations as a Syrian refugee for one week. Check out her inspiring answers as to what she’s doing to show that she’s with refugees, not against them. Why did you decide to do the ration challenge? 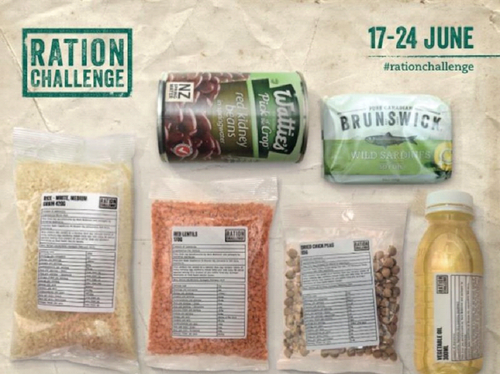 I have decided to do the ration challenge in order to gain a better understanding of what struggles refugees face and the reality of how little access they have to basic human necessities (such as food) they have displaced. Eating like a refugee for a week will I’m sure be tough because of the normal food intake I’m used to, but this just seemed like all the more reason to do it, in order to understand how refugees need our support from around the world to improve these conditions. It also just seems like a small sacrifice to make when it could potentially make a real difference in the lives of those living in refugee camps in Jordan. 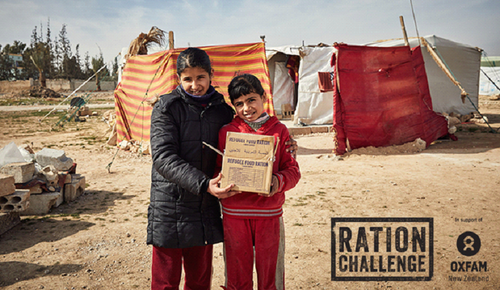 These camps are full of families who have had to flee Syria to escape the violence and killings, and the fact that I could possibly help buy raising money to provide food, education and medical care is my main motivator to complete the ration challenge. What do you think is the biggest issue facing refugees in NZ? From what I know of refugee resettlement in NZ, what seems to be a key issue is the lack of mental health education provided, as well as a follow on problem of refugees not seeking mental health support when required. Refugee services in NZ have found that many refugees, having experienced trauma and violence in their lives, suffer from mental health issues. However it has also been seen that they do not reach out for help from professionals or their families out of shame and stigma – or if they do it is often many years after their arrival here. I feel like this is a huge issue, as even though refugees may feel safe in NZ, and be grateful to be away from where they have fled from, the fact that they are still suffering without help is an indication of a failing of our settlement procedure. This could be addressed hopefully in the near future with more extensive education given about mental health, and an emphasis on destigmatising these problems and offering support repeatedly so they know they are not alone in this struggle.